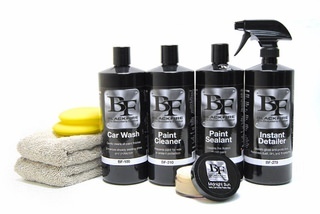 Blackfire Car Care Products are the culmination of more than 30 years of experience in developing premium car products to meet the most stringent standards and expectations. The formulas are the result of over twenty years of research with state-of-the-art polymers from Germany, Sweden and the US. These water-based formulas clean, condition, polish and protect without the strong solvents found in most car care products. Blackfire products are some of the most technologically advanced car care products on the planet. Every product is hand made in very limited production runs. Blackfire products are passionately made by enthusiasts for enthusiasts.